We just loved Dalyan.we were on holiday in 2002 and liked it so much end up to built a villa.resulting guest coming back again and again to villa eden and enjoyed the place.it is home away from home. En-suite bathroom with shower to bedroom 3. Shared family bathroom with shower upstairs. Shared family bathroom with shower downstairs. Hot water via solar power and by electric system on cloudy days. Oven, hob and hood, large frost free fridge/freezer, washing machine, dishwasher, microwave, toaster and kettle. Notes on accommodation: There is a baby pool joining the large pool. Outside BBQ. Koshk [gazebo]. Hammock. Many plants . Board games -travel baby cot[stored in double bed s base . wifi available and good team to make your stay easy. Also the welcome pack with each booking.two push bikes blue and red.can help with airport transfers in turkey. Outside: There is a 40msq swimming pool depth is 5 feet to 5.10 with 3msq baby pool, an outside shower, 4 sunbeds, 6 seater terrace table and chairs with parasol. Patio doors leading from the villa to the terrace and pool area. Cleaning / Towels / Linen / Maid service: All bed linen and towels are provided. The property is cleaned thoroughly prior to any rentals. There is an option of a mid week clean. The pool is cleaned every morning and the garden is tended to every second day. Villa is in a good location 10 minutes walk into town, or 5 minutes if you hire bikes. The villa was very clean, beds are comfortable, down stairs furniture slightly dated or tired but spent most of time on veranda so didn't matter, plenty of hanging space, and the kitchen is fully equipped for most holiday dining. The pool was amazing much larger than we thought and the kids had so much fun in it. The pool man came every other day to clean and hover the bottom. Plenty of garden furniture and sun beds two hammocks. Air con very efficient especially at night. Great view of mountains all around. Would recommend for a great family holiday. The villa is conveniently situated for walking into town (10-15 mins) and the new market location. It is well equipped for a family stay (plenty of crockery and cutlery, dishwasher and washing machine) and the pool/children's pool were well maintained. It is very useful having two bikes at the property. Ricky, the property manager, was very attentive and helpful. We stayed with our daughter, son in law and grandson, have been here 3 times now and will come back again. Myself and my family have just returned from a 10 night stay at this villa and we truly had the best time ever. The villa itself is very spacious and had everything we needed! The air conditioning was amazing and well needed in 35 degree temperatures! The pool was a great size for us all and was cleaned every day! The kids absolutely loved spending most of their day playing in here! We used the bbq most evenings and sat outside for eating. The outside shaded seating area was also amazingly helpful for the kids. The 2 hammocks were very relaxing and the grape vine growing over the top was beautiful. The garden was so beautiful, full of lemon, orange and pomegranate trees and pretty flowers. The passing cows everyday was also a joy for the kids who loved watching them. The location really is only a 10 minute stroll to the centre, with Migros, bim and sok, all supermarkets being right there as you come into the town. Bikes are brilliant as only took a couple of minutes to get to one of these supermarkets to get any food needed. We definitely recommend this villa and would definitely stay here again. Shabbir the owner and Pasha the manager were both always helpful before and during our holiday and were always on hand to answer any questions. This was our second time at the villa (first time we've ever returned to the same villa in all our years of family holidays) and we again had a fantastic time. The location is great, close to the riverside restaurants and local shops but peaceful and relaxing. The bikes are a bonus, leisurely cycle to get fresh bread beats walking in the heat any day. As with last time, any problems were quickly resolved - we had a problem with the wifi, emailed Shabbir and it was fixed later that day. Loved the fact the local turkeys meandered past a few times and the loved watching the daily trek by the three cows who always managed to squeeze between the car and garden wall no matter how tight it was!! Since our last visit, the villa was as we remembered, maybe do with a wee bit repair on garden walls and replacement linen but the villa manager told us that was in hand. The pool was clean and serviced daily as was the garden. Shabbir was really helpful throughout the booking process, great communications and was more than happy to let us have a late check out to fit in with our flight home. Will definitely be back! We know Dalyan and so chose this villla based primarily on its ideal location and as a result of the reviews that stated tha it was clean and well equipped. We arranged transfer to the Villa from Dalaman airport via the owner and this was perfect, with our driver waiting at the airport on our arrival as planned. We may have been unlucky as we were clearly the first customers of this year but when we arrived at the Villa it was clearly not very clean. The kitchen floor was dusty, the bin was filthy and the cupboard under the sink was damp and therefore had small insects crawling around inside. It was suggested that there would be a small welcome pack but this consisted of five stale cakes albeit there was fresh milk, teabags and water. The freezer door had clearly been closed and switched off during the winter and switched on again prior to our arrival. It was therefore full of mould that had now been frozen... we spent the first morning cleaning things. The bedrooms and bathrooms were clean but everything was tired and in need of replacing. The bedding and bath towels were clean but were clearly old and the pool towels were stained from years of use. There were no spare towels or bedding. The advert for the Villa stated that you could pay for an additional midweek clean of the Villa which we assumed meant that the Villa would be cleaned at the end of each week. We stayed sixteen days and the Villa was only cleaned by us. The worst part on our arrival was the state of the pool. There was a lot of dirt at the bottom of the pool, green residue covering the tiles and a large quantity of leaves/ foliage floating on the top. The first morning the pool man arrived and made comment that the pump was not working and took it away to be fixed. He then arrived that afternoon and spent several hours cleaning and vacuuming the bottom and using the net to get the floating debris off the top. The render is falling off the garden walls and it is clear that the Villa is in need of some serious updating to bring it back to its former quality. As a positive, the Villa is a small three bedroom property that is ideally placed, being a ten minute walk from town. The air conditioning worked effectively and the wifi was very good. Dalyan is considered to be a village but it grows into a small town during the summer season. Situated alongside the river leading from a large lake (Koycegiz) from where it meanders through the delta and towering reeds (wrongly said to be the location for the filming of the African Queen but you will understand why some people believe this to be true) to the Mediterranean. Ancient delights abound with the magnificent rock tombs overlooking Dalyan from across the river, leading the way to the Ancient City of Caunos where there are superb Roman ruins to be found (concerts are occasionally held at the amphitheatre) and archaeologits continue to work there making new discoveries each year. There is a good local access to Itzuzu 'Turtle Beach'. It is 25 mins by minibus and 40 minutes by public boat. 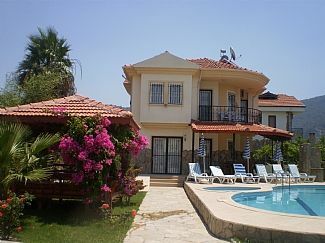 The nearest airport is Dalaman international which is 25 mins and 30 miles from the villa. Dalyan town centre is a 10 minutes walk. Ortaca is the nearest city and is 10 miles away from Dalyan. Dalaman is 30 miles. Fethiye is 40 miles. Mamaris is 90 kilometers. Mud bath is a boat trip away. All the restaurants, supermarkets and banks are a 10 minute walk. Booking Notes: Telephone or email for availability and booking. A deposit of 25% is required at the time of booking and full payment 4weeks before occupancy. 200 deposit to book the villa Eden. Changeover Day: Flexible.